Transcribed and compiled by Suzannah Foster. Reproduced with her gracious permission. 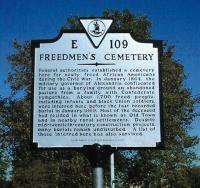 The following information is extracted from the Fairfax County Register of Births, Deaths and Marriages for 1853-1859. All surnames have been provided where possible. In some cases, a presumed surname, indicated by parentheses, has been supplied, based upon other sources or subsequent entries. This document is available as a PDF file; to view click here. This document is also available an MS Excel file; to view click here.